ΠΑΚΕΤΑ ΗΛΕΚΤΡΟΝΙΚΩΝ ΤΣΙΓΑΡΩΝ :: MODS ΜΠΑΤΑΡΙΟΘΗΚΕΣ ΗΛΕΚΤΡΟΝΙΚΕΣ & ΜΗΧΑΝΙΚΕΣ :: KANGERTECH K-SIMAR 20W 18650 GRAVITY OLED MOD - Funstore.gr the fun side of shopping! 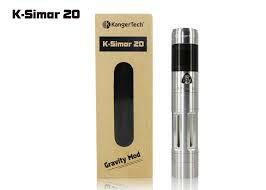 K-Simar 20W Gravity Mod is the first large electronic cigarette battery by Kangertech. The mod is made of stainless steel and comes with an OLED screen the show the current wattage output, resistance value and power indication. The built-in gravity sensor provides you brand new way to adjust your wattage from 7W to 20W. Unscrew the bottom cap, put in the battery cell and screw the bottom cap back on tightly. Fast press the power button 5 times in a row within two seconds to turn on or off the device. Press the button 5 times in 2 seconds to choose the setting mode page. When in setting mode, the output wattage will show in the OLED screen. Lean left to reduce the output wattage and lean right to increase the output wattage. NO battery/atomizer/cartomizer included. You can find 18650 battery here. There is CE mark on the mod.